Gorgeous patio home backing to tree row! Excellent open and spacious floorplan. Beautiful engineered hardwood flooring in living, kitchen and dining areas. Large granite kitchen with stainless appliances, island, gas stove, pantry and loads of cabinet and counter space. This home offers two bedrooms PLUS a dedicated office with gorgeous new carpet! Spacious master suite includes large ensuite granite bath with tiled walk-in shower ---- along with a reading/sitting room off the master that opens onto the private outdoor courtyard. Master closet is quite large and includes built-in dresser! You can move right into this tastefully decorated home! Private courtyard area along with lots of green space available for a pet (iron fencing is allowed). This home also includes a certified storm shelter structure in the garage. Watercress Village offers its residents a beautiful clubhouse available for private functions that includes a spacious gathering area, full kitchen, exercise facility and a heated saltwater pool. HOA dues include lawn care, snow removal, sprinkler system on a common neighborhood well, and trash. Exterior maintenance includes cyclical exterior painting -- does not include windows doors, roof, or routine exterior caulking maintenance. 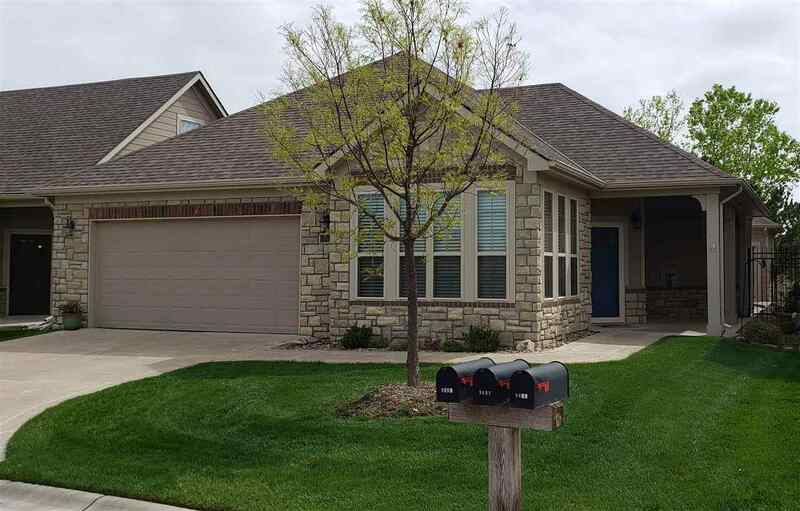 This home qualifies for the City of Maize Tax Rebate Program through 2023, and is transferable to the new owner.